Wedding season is upon us and if you’re writing your own vows, you’re probably wondering “where on earth do I start? !” Below, we’ve provided bite-sized steps to help you create personalized vows that won’t feel cookie cutter. Be sure to start writing your vows early; at least 3 months prior to your wedding. 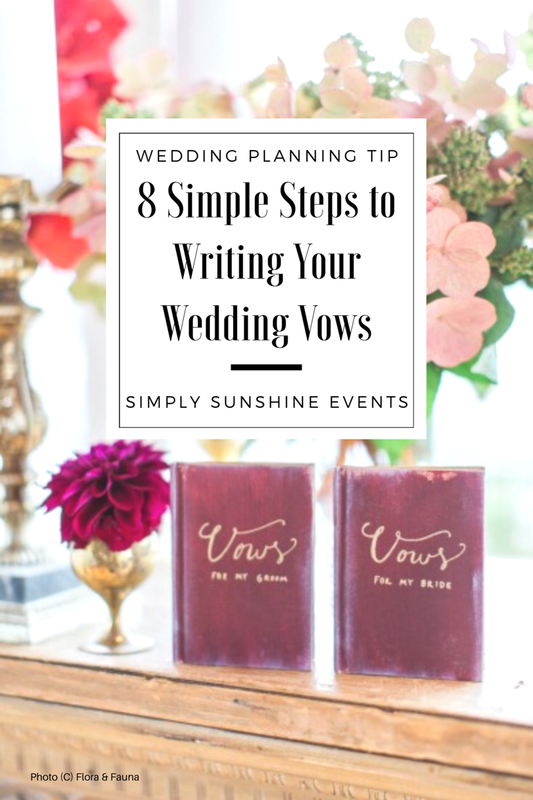 This will give you the time you need without feeling rushed and will allow enough time to complete all of your other wedding-related tasks leading up to your big day! The best news is, these steps can either be done all at once or over the course of a few weeks. If you decide to write them over time, we recommend completing each step in its entirety so you don’t lose your train of thought or become distracted. 1. Ask your officiant. Always ask the person officiating your ceremony if personalized vows are allowed! Some officiants welcome personalization while others may need to abide by the rules of your religion or the way they perform wedding ceremonies. Length of your vows: We always tell our couples to keep them to about 1.5 – 2 minutes in length each. This way, you take the pressure off of yourselves and your guests listening. Tone: Are you the funnier one and your partner more poetic? This is a great time to agree on the tone of your vows to one another. This way, they feel well-planned. Agree on topics: It’s important you outline the types of memories, topics, nick-names, etc. that you’re comfortable with all of your family and guests hearing. Some things are best shared between the two of you! Allot a manageable amount of time to sit down and dedicate your time and energy. We recommend starting off with 15 – 20 minutes in a quiet location. Make sure you take care of general needs – get something to drink, eat, use the restroom, dress comfortably, etc. This will cut down on distractions while you focus. Find a quiet location where you won’t be bothered or distracted. When did you realize your partner was the one? What is something you look forward to doing with your partner? What do you promise your significant other? Focus on 2 – 3 promises that will act as the common thread throughout the rest of your lives together. 5. Just write it out. Now that you have your blueprint, we hope that it’s easier for you to begin writing out your vows. Our biggest tip here is to write how you speak. That’s right! Make it conversational. By enlisting this guideline, your vows will feel personal and will avoid clichés. Secondly, don’t write it for your guests’ entertainment, write it for your partner. Conversely, avoid inside jokes that don’t lead to the bigger picture of what you’re saying – remember, you have a limited amount of time to say your vows on your wedding day and inside jokes that don’t have context will get lost to those listening. 6. Read your vows out loud… and edit. Go ahead, read them out loud. Read it to yourself in the mirror. It may feel awkward at first, but this will help you identify any tricky or repetitive wording. It may also catch a few grammatical mistakes while you’re at it! This is also a great opportunity to time yourself. Your vows should max out at 2 minutes. 7. Receive approval. Some officiants may require approving your vows prior to your wedding. Make sure you send these at least one month in advance. This way, if anything needs to be further refined, you have the time to do it… and to get it approved again. 8. Print it out. Please, oh please, don’t put your vows on your phone to read at your ceremony. It looks really bad, and most of the time, the print is so small you wind up holding your phone directly in front of your face when you should be looking at your partner. Print out your vows on a heavy cardstock paper so it feels substantial (we recommend anywhere from 80 – 100lb paper from your local office supply store). Then, make sure to send your officiant an electronic version and print out a couple of additional copies to have on hand. If you have a wedding planner, they should have extras on file for you as well just in case. We hope you found these tips helpful! Remember… K.I.S.S. Keep it short and simple!